“Annenberg Classroom’s That’s Your Right” game has been named a finalist for a 2015 Games for Change Award. 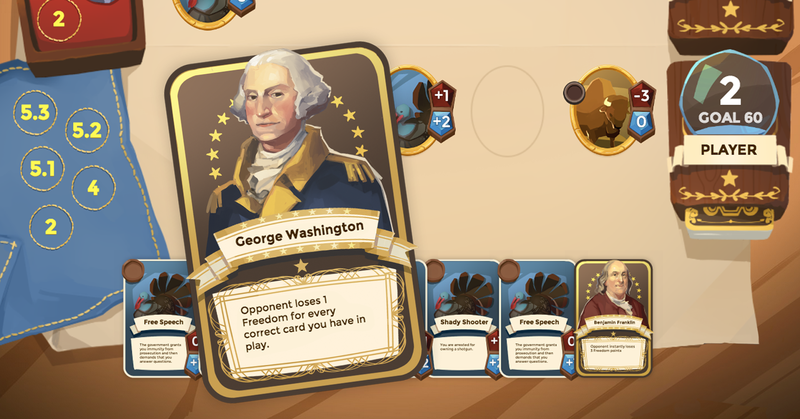 The game, a single- or multiplayer digital card game that teaches students about the first 10 Amendments to the U.S. Constitution, was selected as one of the three finalists in the Best Gameplay category. It also is one of eight games competing for the top award, Game of the Year. The game was developed by Annenberg Classroom, at the Annenberg Public Policy Center of the University of Pennsylvania, in conjunction with Filament Games, a producer of educational games based in Madison, Wis. To play, students must match up constitutional concepts — such as the right against self-incrimination and freedom of religion — with different kinds of real-world issues. “We are honored that ‘Annenberg Classroom’s That’s Your Right’ game has been recognized for its effort to educate young people about the rights and protections that are guaranteed in the Constitution’s Bill of Rights,” said Ellen Iwamoto, the policy center’s writer/researcher who oversaw development of the game. The Games for Change Award winners will be announced April 22 at the 12th annual Games for Change Festival, which celebrates “the positive power of digital games.” The festival is part of the Tribeca Film Festival in New York City. The eight finalists were selected by experts in games and social change from among nearly 150 submissions. Besides “Annenberg Classroom’s That’s Your Right” game, the other finalists for Best Gameplay are “Never Alone,” described as “an atmospheric puzzle-platformer” created in collaboration with the Iñupiat, an Alaska Native people, and “This War of Mine,” in which players lead a group of civilians who are trying to survive in a city under siege. For more about Annenberg Classroom’s game, click here.